Elder hired three new security officers this year who all have been involved in law enforcement before. This year there are a few additions to the staff around Elder. If you haven’t noticed yet there are three new security guards roaming Elder’s grounds to make sure we are always safe, secure, and prepared. 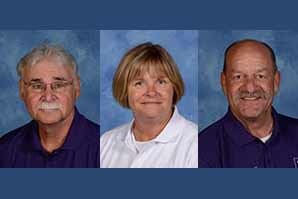 The three new additions are Ms. Jenny Ernst, Mr. Joe Priestle ’74, and Mr. Bob Liston ’72. Ms. Ernst went to high school at Our Lady of Angels which is now Roger Bacon and graduated in 1981. Out of high school she worked for the state of Ohio at a facility for the mentally ill. During that time she was also a part time firefighter for Colerain township for many years. After her job at the facility, Ms. Ernst became a Cincinnati Police officer and was one for 25 years. While in law enforcement, Ms. Ernst worked in many different aspects of the job. She did patrol work, some undercover work, was in the ATF task force, and was a US marshal and chased down fugitives. But Ms. Ernst added that Patrol K9 was her favorite. Ms. Ernst noted that she will be here as long as Elder lets her. So I think Elder we be in good hands for years to come. Next, we have Mr. Joe Priestle. Mr. Priestle graduated from Elder in 1974 and was actually the student council president his senior year. Mr. Priestle also was involved in various clubs throughout his time at Elder. After Elder, Mr. Priestle was a police cadet for the city of Cincinnati which is a co-op program with UC where you work for the police department for a semester then go to school the other semester and this took him four years to complete. After that he worked on the Cincinnati Police Department doing various things such as being a K9 officer and doing homicide investigations. Mr. Priestle explained to me that he liked being a cop. He said that it was something new everyday and he got to do a lot of stuff that not everyone can do. He explained that this is another reason he came back to Elder. He felt he could use his talents here at Elder the best. Finally, we have Mr. Bob Liston. Mr. Liston graduated from Elder in 1972 and wasn’t able to do much in high school so he worked. He had his first job when he was 16 and worked every week so he could go out and be with his friends. After high school, Mr. Liston did the same thing as Mr. Priestle and became a police cadet. After the police cadet program, he got a job at the Cincinnati Police Department. While he was at CPD he was a K9 officer, a fraud investigator, a homicide investigator, and was undercover working with the highest narcotic crew while also supervising four other undercover officers. He was in the police department for a combined 36 years and retired in 2011. Mr. Liston came to Elder because Mr. Priestle recruited him. Actually, Mr. Priestle set up the security force and was able to get everyone on board. Mr. Liston explained that his day-to-day activities include roaming the building making sure its secure, visiting the PAC, and opening and closing the gates. This year is actually Mr. Liston’s first and last year on the security team. Mr. Liston is set to retire but his service here is greatly appreciated as he has done a great job. The security team here is great as the members of our team are extremely experienced and know what to do in a panic situation. I think Elder did the right thing by having their own security team. Hopefully this crew sticks together and continues to help keep Elder secure for years to come.